The FIFA World Cup kicks off today, and so, as is mandated by international law, seemingly unrelated products must display their unconditional love for football. 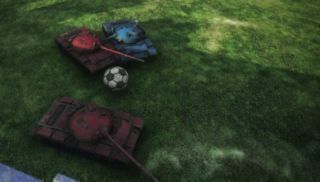 For World of Tanks, this means players can now take a break from blowing each other up in a field, and instead blow each other up in a field that also has a large ball in it. "The reworked Himmelsdorf will become the place of real football battles! Form a platoon of 3 players and show everyone what you are capable of. Matches will be held in a 3x3 format and will last 7 minutes. The first team to score 3 goals wins. Become the best goalscorer of World of Tanks!" Upon entering the game, players will find a new custom created Tier 1 T-62A Sport in their Garage. Special achievements will be available throughout the event, as well as missions and a 'Football Player 2014' medal. It's kind of like that thing they do in Top Gear, where two teams of small cars face off against each other. You know, except it's with tanks, and the whole thing isn't presented by a tiresome pantomime xenophobe. The game's World Football Championship mode will be live for length of the real-world tournament, which ends on July 13.